All interfaces of Colibri modules are designed to be easily accessible by external hardware. 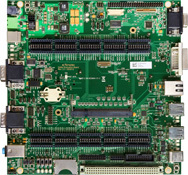 The required hardware and standard connectors for most common interfaces are already integrated. On-Board DC/DC converters deliver up to 5 Amps at 5V and 3.3V for additional hardware.